A new GEF-funded, World Bank-implemented project, Securing Livelihoods, Conservation, Sustainable Use and Restoration of High Range Himalayan Ecosystems project (SECURE Himalaya), was launched on 2 October 2017 as a response to the growing crisis of illegal trafficking in wildlife. A new Global Environment Facility (GEF) supported effort to protect the iconic snow leopard and its natural mountain environment was launched today at the start of the Global Wildlife Program (GWP) annual conference in New Delhi, India. The project, Securing Livelihoods, Conservation, Sustainable Use and Restoration of High Range Himalayan Ecosystems project (SECURE Himalaya), was launched by Dr. Harsh Vardhan, Honorable Minister of Environment, Forest, and Climate Change of the Government of India and the United Nations Development Programme (UNDP). It is part of the GWP, a seven-year program funded by the GEF and led by the World Bank, that was developed as a response to the growing crisis of illegal trafficking in wildlife. SECURE Himalaya received a GEF grant of $11.5 million, and will receive over $60 million in co-financing from the Indian government. It is being implemented by the Government of India in partnership with UNDP to sustain critical ecosystem services and to conserve vulnerable snow leopards by securing community livelihoods, enhancing enforcement, strengthening community institutions, and improving knowledge, advocacy and information systems for promoting landscape-based conservation approaches. 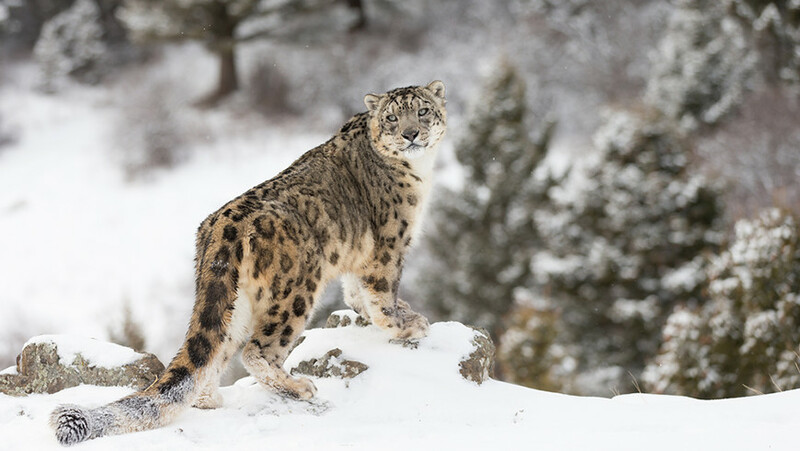 This project will contribute to the Global Snow Leopard and Ecosystem Protection Program (GLSEP), an effort to conserve the species in the 12 range countries, including India. A renewed commitment to the conservation of the species and the GSLEP was made at the "International Snow Leopard and its Ecosystem Forum" held in Bishkek, Kyrgyzstan, August 2017. Co-hosted by the GWP, the World Bank, UNDP and the Government of India, the annual conference this year is called People's Participation in Wildlife Conservation, and is convening 100 participants from over 20 countries in New Delhi and the Pench Tiger Reserve, India, from October 2-5, 2017. It is an occasion for GWP country focal points to discuss specific issues regarding the projects in their countries as well as to facilitate knowledge exchange. “This conference is of the outmost importance to the wildlife conservation community not only in India but around the world. Without local communities participating and benefiting from wildlife conservation, it is going to be very hard to win the current war against poaching and the international illegal trade of wildlife and wildlife parts. This conference promises to deliver solutions to this crises that affects us all," said Jaime Cavelier, Sr. Biodiversity Specialist at the GEF. “UNDP is proud to support the Government of India in the ‘SECURE Himalaya’ partnership, which is a recognition that people’s participation is critical to protecting the biodiversity wealth of the Himalaya’s and in securing the lives and livelihoods of local communities,” said Marina Walter, Country Director a.i. UNDP India. “Through the SECURE Himalaya project in India, our partners will build alliances between the private sector, local communities and local government authorities. We hope this conference will give our stakeholders in India and our partners across the GWP’s 19 countries the ability to engage people in wildlife conservation across all walks of life,” said Claudia Sobrevila, the GWP’s Program Manager. India’s rich wildlife is critical to the prosperity of its growing population. One of the GWP’s main objectives is to promote the co-existence between people and wildlife. Engaging people across all sectors is therefore critical for the survival of many endangered species. The project will develop participatory natural resource management practices and enterprise-based sustainable livelihoods for local communities that will help safeguard the future of local economies as well as the survival of critical species. Conference participants include several ministers in charge of wildlife and/or forestry or tourism departments from the GWP countries as well as other government officials and national project leads, senior representatives from GWP partner organizations including the GEF, UN agencies and international NGOs, as well as youth and private sector representatives. This conference is designed to provide a platform for the project leaders to raise awareness, showcase, and learn from African and Asian experiences. The GWP is a $131 million global partnership on wildlife conservation, crime prevention and sustainable development led by the World Bank and funded by the GEF that coordinates with partners in 19 countries across Asia and Africa (Afghanistan, Botswana, Cameroon, Ethiopia, Gabon, India, Indonesia, Kenya, Malawi, Mali, Mozambique, Philippines, Republic of Congo, South Africa, Tanzania, Thailand, Vietnam, Zambia, and Zimbabwe) to improve wildlife and protected area management, enhance community livelihood benefits, strengthen law enforcement, reduce demand of illegal wildlife products and accelerate learning on relevant topics on the illegal trade of wildlife. Many of the GWP’s national projects invest in activities that involve the active participation of individuals and communities in wildlife conservation so they may benefit from the economic value of wildlife through tourism or alternative livelihoods in order to sustain conservation efforts. View the UNDP press release here.